Thanks! It is very good. I saw this on TVB before. The chief actually rinse the sweet rice with boiling water for 15-30 seconds before cooking it. That way the rice will not as sticky. All the rice will be by itself and chewy. I made it once not too successful, need to try again. found a videoclip in youtube, the chef steamed the glutinous rice first, seems work too and less greasy. yours looks great but it's summer here, so have to wait until winter to try again. thx for sharing. 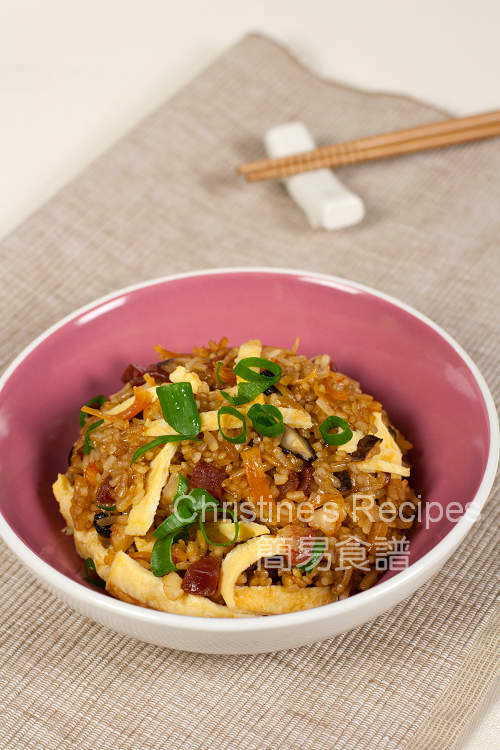 I have made fried glutinous rice for quite a number of times. I use 易潔 pan every time and it never fails. You also wouldn't need much oil. 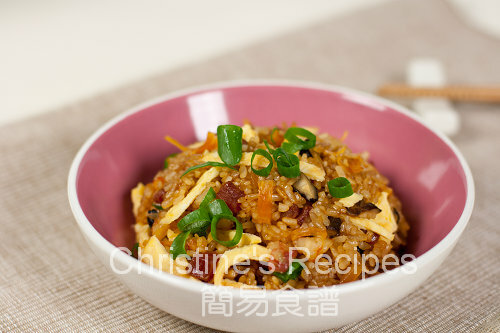 I have tried steaming or cooking glutinous rice in rice cooker before, but I found pan frying soaked rice is the quickest way if you are cooking for your family, not for a party. :) Chopping and prepping all the ingredients takes much more time and that's why I don't do this very often. Use hot water and cover the pan with lid periodically speeds up the cooking process. A friend of mine says she always soak the rice for only thirty minutes. I would like to try that next time.